WILDLIFE CARERS: Carmel Harris, 71, with fellow senior wildlife warrior, Adrian Holbeck, is saving the Green Sea turtles one Tinder date at a time. IMAGINE an environmental protest where there is no violence, no ugly scenes of police battling activists; just two groups of people sitting down, talking and expressing their sides of a divisive issue. That could be the changing landscape of protesting if Carmel Harris and her fellow silver-haired climate action campaigners have their way. "I think grandparents have a lot to give, they have the time," Carmel said. "And talking to people is really important. "The media often portrays activists as being a little bit looney ... but you don't have to become a violent person. "Once you get involved you see there's quite a lot of perfectly civilized, mature-aged people who are doing it for their grandkids, hoping they get to see (Finding) Nemo and that's going to get harder and harder." Carmel, a 71-year-old who lives in the northern suburbs of Brisbane, was sprung into action when she witnessed the abuse of fossil fuels through her work with the Foreign Affairs Department. A poster-girl for the famous logo 'Think Globally, Act Locally', Carmel started her personal quest at home, changing her "patterns of consumptions" and shrinking her carbon footprint. But it wasn't enough. She had more to give. And the Adani coal mine was in her crosshairs. And what a shock she - and her fellow senior environmentalists - would have given the mine and its supporters. "All around the world in a whole pile of cultures, it's the senior members of society that do a lot of the active work," she said. "Young people are afraid to be seen as demonstrators, in case the bad old days come back and someone takes a photograph of them and they suffer for it. "Us older folk - we don't care! We know someone has to stand up for the future. "And the comradery is really good because you discover you're hanging around with people like you who have the same hopes and concerns for the future." The coal mine and its effect on climate change is set to have a major impact on a region that is close to Carmel's heart: The Great Barrier Reef. Rising temperatures are already beginning to show a sinister side in the northern part of the reef with a mass explosion of gender bias in the population of Green Sea turtles. "It's the warming of the sands that impacts the turtles," Carmel said. "The gender of the egg is changed by the temperature. "So the temperature is high so more females are being produced." 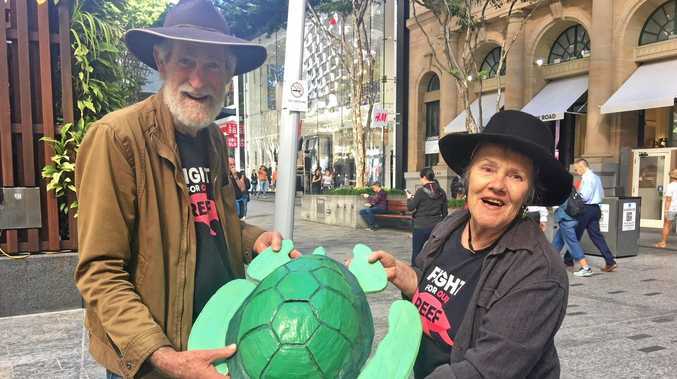 That's why this senior wildlife warrior was recently out promoting climate action and the threat posed to the turtles with the latest tool in finding love - Turtle Tinder. The interactive games, an initiative of the Australian Marine Conservation Society, allowed shoppers and workers in the Queen Street Mall to visualise the odds of male turtles surviving to adulthood and reproducing. "It's so bad that 99 per cent of eggs from the Northern Great Barrier Reef are turning into female turtles," Carmel said. "There's just not enough men around!"